The Panasonic Lumix G 42.5mm f/1.7 ASPH. POWER O.I.S. Lens with UV Filter Kit from B&H bundles the sleek portrait-length prime with a 37mm UV filter. Complementing the optical attributes is a fast stepping AF motor and internal focus design, which provides smooth, quiet, and responsive focusing performance for intuitive handling. The POWER O.I.S. (Optical Image Stabilizer) also benefits hand-held use by compensating for the effect of camera shake for sharper imagery. 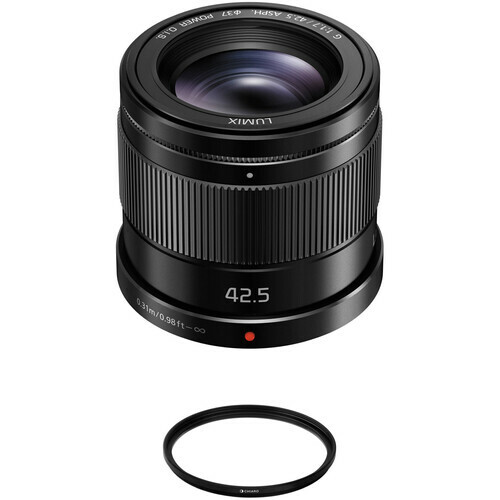 Prime 42.5mm portrait-length lens provides an 85mm equivalent focal length with Micro Four Thirds cameras. Fast f/1.7 maximum aperture enables extensive control over focus position and also benefits working in difficult lighting conditions. One aspherical element helps to reduce spherical aberrations for greater sharpness and clarity. Stepping AF motor and internal focus design provides smooth and quiet focusing performance and functions at a 240 fps signal transfer rate for fast, responsive use. POWER O.I.S. minimizes the appearance of camera shake for sharper hand-held shooting. All-metal lens barrel and bayonet mount offers durability and rigidity. The Hoya 37mm UV Haze NXT HMC Filter is a general use, clear filter that helps to absorb ultraviolet light and protect the front of your lens. Its clear design allows you to pair this filter with others or leave on lenses at all times as a general protective filter. It can also help to reduce dust and moisture and keep them from reaching your lens element while providing additional protection in case of drops or situations where scratching could occur. Box Dimensions (LxWxH) 4.4 x 3.2 x 3.2"